Yesterday I attended a work related holiday luncheon. Once a year all of my counterparts in the area get together to share what works, what doesn’t work, and to have a few ears, who actually can truly understand, listen to what ails ya work-wise. The holiday luncheon obviously includes lunch and a naughty elf ornament exchange. Essentially everyone brings a wrapped ornament and each person draws a number. Your number indicates in what order you get to pick your ornament. #1 has to start with a wrapped ornament but #2, 3, 4 and so forth can either pick a wrapped ornament or steal one from another person that you like. Last year I drew #1. In the end I left with the “worst ornament”, or so I claimed it to be. This turned into a big joke between the person who brought that ornament and me. This year I got #7, out of 8, so I was pumped that I might leave with one of the best ornaments! It got to my turn and I stole an ornament from another girl, this particular ornament had already been stolen several times and what the pick of the litter…it said “1 day of coal, 364 days of naughty. I pick the naughty”, perfect for me right? I thought I was solid as the person who had #8 is more of a fan of cutesy ornaments than funny ones. Well, I could not have been more wrong, she stole that funny ornament right out from under me. 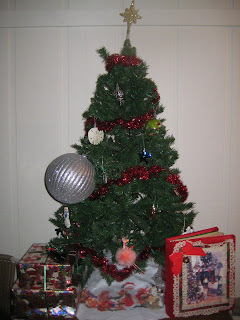 (Did I mention the person who drew #8 is the person who brought the craptastic ornament that I ended up with last year?) I was left with the only remaining wrapped ornament, as I opened it laughter erupted, I am not the proud owner of an 8” glittery Christmas ball. As it turns out the whole thing was rigged and I was intended to end up with this monstrosity as #8 was going to steal anything I had and leave me with the Christmas ball. All in all, my smile muscles got a huge workout and it was decided that next year we will have only one rule…only bring tacky Christmas ornaments, and then nobody and everybody is a winner. Nice!